Far and wide, immigrant great grandmothers and fathers are kicking themselves for not investing in Lower East Side real estate. Just think of the million-dollar nest egg or the rent-controlled apartment you could have left your ungrateful grandchildren if you didn't escape to greener pastures. Nevertheless, the upscaling (and sterilization) of the area continues without you — making East Houston Street, avenues A, B, C...and even D sought-after addresses. Oy vey! Following an interminably-long infrastructure upgrade, East Houston Street no longer resembles a part of the cross-Manhattan expressway that Robert Moses once envisioned. Traffic calming measures, new bike lanes, expanded medians, trees and gardens now make the four-lane thoroughfare suitable for high-end habitation. Marching east from the Bowery, a dozen new developments have gone up in recent years. 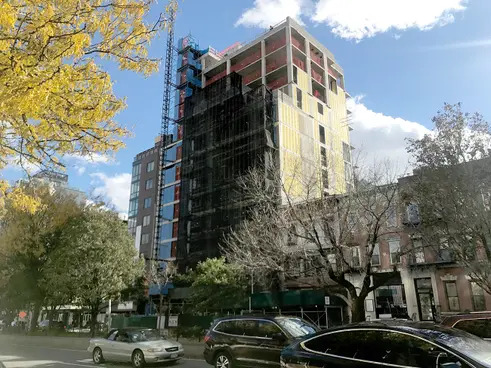 Universally unattractive, they range from the Whole Foods-housing rental The Chrystie built by AvalonBay to the Marshalls-topping condos at 196 Orchard Street. 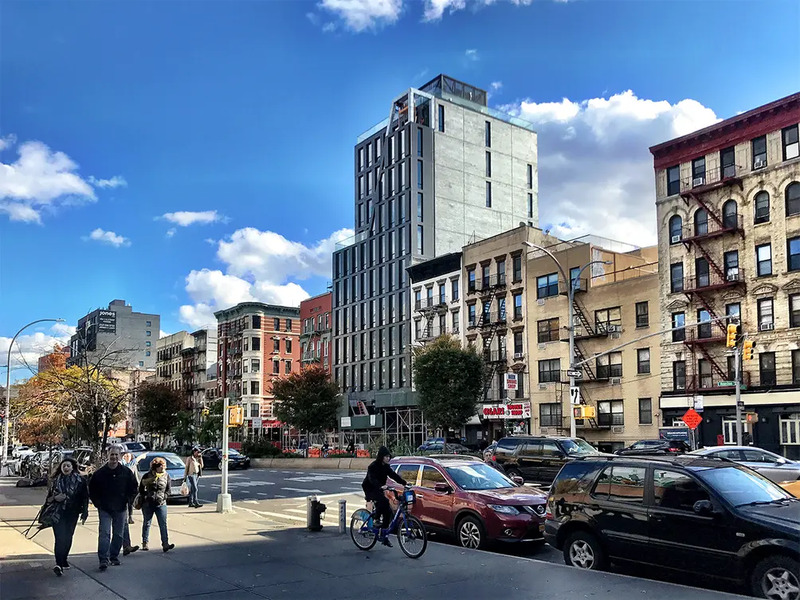 Finishing construction near the corner of East Houston and Clinton streets is the street's most palatable new development yet. 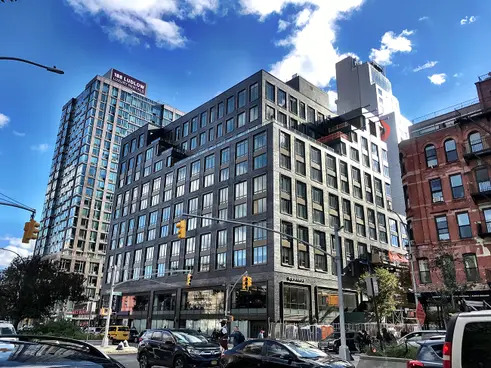 Dubbed 287/LES (for its address at 287 East Houston), the 11-floor condo was developed by Vinci Partners and Hogg Holdings who purchased a former movie theater-building at the site for $15.2 million in November of 2014. Recently, the team pulled the curtains down on the building's staid black facade. The building's design was conceived by Aldo Andreoli's AA Studio with Jeffrey Cole serving as the executive architect. Our architecture critic Carter Horsley likens its brooding facade, composed of grey stone, black brick, steel, and elongated windows, to Darth Vader's mask saying it represents the Star Wars antagonist arriving on the LES with all his dark magnificence. AA Studio cites the classic castiron buildings found throughout downtown as the true inspiration. 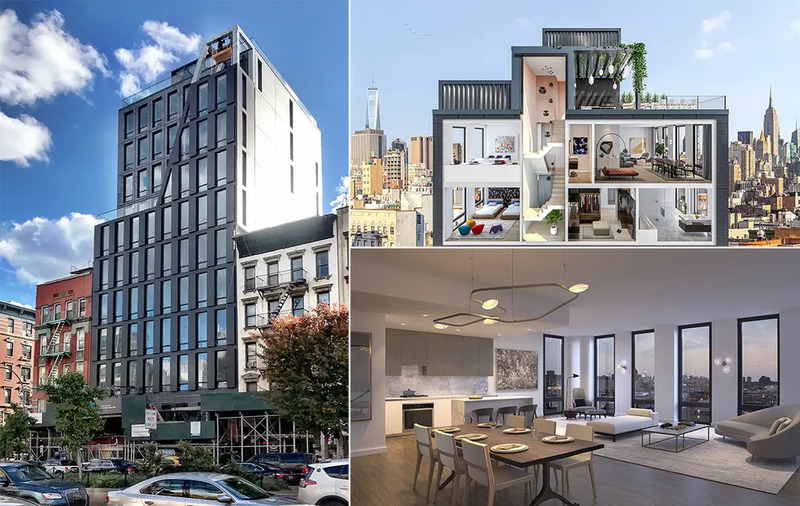 The marketing babble explains, "At the intersection of cacophony and harmony, street and sky, 287 East Houston Street unites intelligent design with modern craftsmanship." Laid out inside are 28 residences, each with intimate and efficient layouts with "immaculate and adaptable details." Every home has 10’ ceilings, floor-to-ceiling windows, and seven-inch-wide white oak flooring. There are Meile kitchen appliances as well as a washer/dryer in a separate closet space. The kitchens are also fitted with custom Italian cabinetry by Alta, lacquer cabinets, and a honed Cararra marble countertop and backsplash. 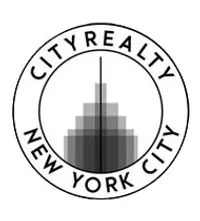 Available one-bedrooms are priced from $1.15 million and two-bedrooms start at $2.7 million. 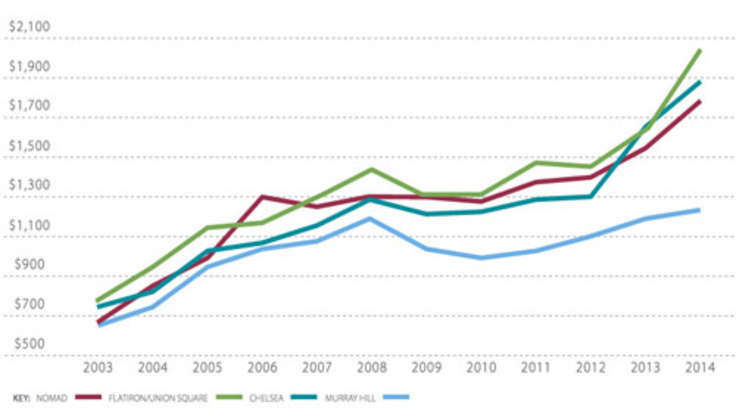 Prices blend to an average of $2,102 a foot, right about the average PPSF for a new development condo in Manhattan. Crowning the top three levels is the Penthouse B, a nearly 2,000-square-foot three bedroom with a 479 square feet rooftop entertaining space with postcard views of Midtown and downtown. Priced at $5,700,000, the aerie has a living floor with a 23-foot-wide living and dining room, a private level with three bedrooms, all connected with a dramatic windowed staircase. Shared amenities include a part-time doorman, virtual doorman technology, a full-time superintendent, a fitness center, bicycle storage, private storage for purchase, supplemental commercial-grade laundry room, and a landscaped common rooftop terrace with an outdoor kitchen. According to our listings, at least half of the apartments are in contract. Closings are anticipated for December 2018.